The recreation therapy team at Canuck Place works some serious magic, ensuring that children and teens of all abilities in their care are able to participate in almost any experience typical to other kids their age. Sometimes however, this talented crew need some help, and that’s where the Abbotsford Fire Fighters Association IAFF Local 2864 answers the call. These local fire fighters have been volunteering with Canuck Place since 2010, when they were first approached about helping Canuck Place take kid and families to a local fish hatchery. Since then, they’ve volunteered with Canuck Place at more than a dozen events, at everything from fundraisers, to a day on the lake. This July, 11 volunteers donned neon yellow shirts and helped make a day at Cultus Lake Waterpark possible for 14 families. 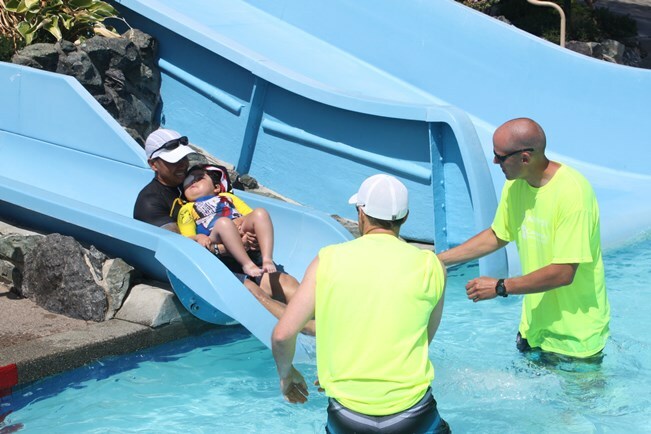 Many of the kids on the Canuck Place program use wheelchairs, so the Local 2864 firefighters carried them to the tops of slides where their chairs couldn’t reach, stablized tubes, and provided general assistance getting in and out of the pool, ensuring everyone had a fun, and safe time. “The chance to help make these kids feel like kids, if only for a few hours, is something we really enjoy,” explained Kirk Holt, who organizes the volunteers from Local 2864. The Hernandez family was in attendance for the second year, with six year-old Mason. 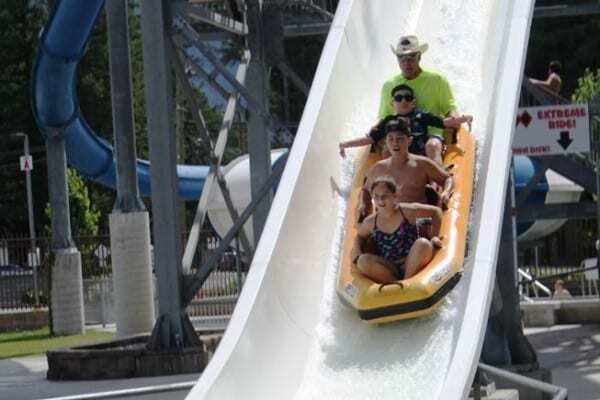 Overall, a day at the water slides was a fun and memorable one for families, and for our generous volunteers. The Canuck Place recreation therapy program needs your support to continue to provide these memorable experiences to BC’s children and families with life-threatening illnesses. Please consider making a donation today.